I'm back on the build! And this time I mean business!... well, I thought I was back on the build. I've encountered my first set of problems which are either based on a slight incompatibility of the parts I purchased or I need more parts! 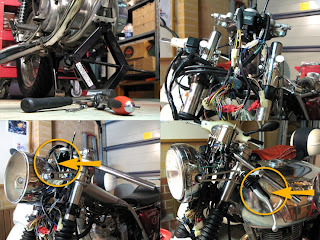 After slowly jacking up the bike, and in turn loosening and lowering the forks, I managed to slide in place the new headlight brackets and clip-on bars (top left and right images respectively). This is when I discovered the first of three problems (bottom left image). Firstly, the vintage headlight overlaps the main switch assembly (ignition) so that if I want to use this light I have to move the switch and probably replace the top yoke, which is my second problem. My third problem (bottom right image) is that the decompression lever hits the broad tank... I think I need a new clutch lever with the decompression lever on top. In this final image I have reverted to using the original headlight which is shallower but of a much larger diameter. While in my possession the bike has only done about a weeks worth of riding, and the motor hasn't been turned over for 2 months now so I'm getting eager to ride the bike again. I'm also keen to check that I haven't inadvertently done something to the engine immobiliser so that the bike no longer starts. I know that the longer I wait to start the bike the harder it will be to diagnose starting problems as the number of variables climb. Try moving the headlight and brackets down, they are up a little high. Secondly, if the bars are set correctly you should be able to retain the standard yamaha lever with de-comp in place, it is a juggling act to get it all in place but it is very doable..